Fresh fruits just got sweeter with your Hong Leong Credit/Debit Cards! Give your lifestyle a burst with fresh fruits from Crunch6. Enjoy value-for-money deals with Hong Leong Cards or simply invite your friends to join its ‘Group Buy’ for even crunchier deals. Shop for your wardrobe staples from Love, Bonito and get exclusive RM18 OFF! From workwear, party dresses, casual outfits, affordable staples and more! Shop with your Hong Leong Credit/Debit Cards at any Love, Bonito outlets, and get RM18 OFF for every purchase of 2 normal price items. Pick the perfect pair of eyeglass frames or sunglasses and enjoy additional 10% OFF with your Hong Leong Cards. 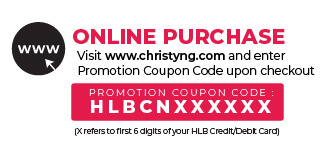 Hong Leong Credit Card Promotion - Enjoy 15% OFF with every hijab purchase @ Hijabista Outlet, Jalan Tuanku Abdul Rahman, KL. Look fabulous with so many hijab styles to choose from and get 15% OFF when you pay with your Hong Leong Cards. @ Hijabista Outlet, Jalan Tuanku Abdul Rahman, KL.